As efforts gather pace in Basel to determine which insurers should be deemed globally systemic, the American Insurance Association tells Global Financial Strategy that the process is wrongheaded, lacks transparency and may seriously harm the US market. Will Henley reports. US insurers are waiting with bated breath to find out whether, under the rulemaking process set in train by last year’s Dodd Frank Act, they will be deemed of such importance to the economy that they are “systemic”, or too big to fail. With memories of the catastrophic failure of AIG in 2008 still fresh, regulators are keen to ensure that the insolvency of any major insurance company in the future does not require a costly, and possibly unaffordable, taxpayer funded bailout. 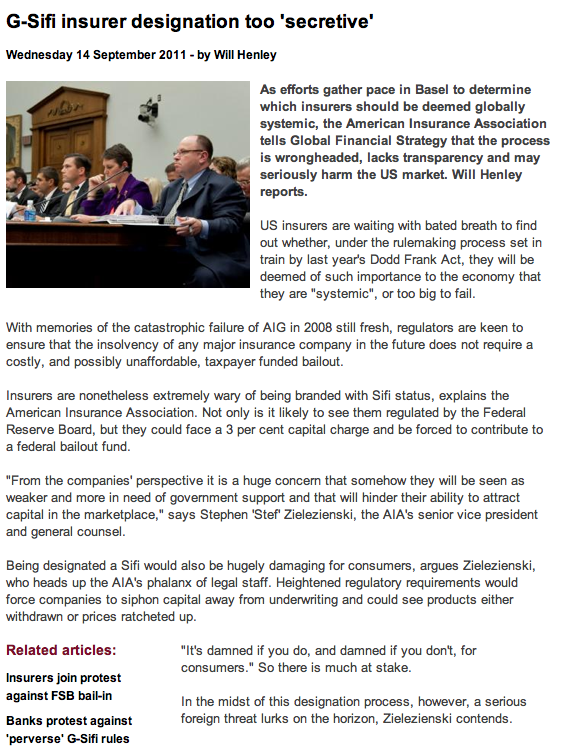 Insurers are nonetheless extremely wary of being branded with Sifi status, explains the American Insurance Association. Not only is it likely to see them regulated by the Federal Reserve Board, but they could face a 3 per cent capital charge and be forced to contribute to a federal bailout fund. “From the companies’ perspective it is a huge concern that somehow they will be seen as weaker and more in need of government support and that will hinder their ability to attract capital in the marketplace,” says Stephen ‘Stef’ Zielezienski, the AIA’s senior vice president and general counsel. Being designated a Sifi would also be hugely damaging for consumers, argues Zielezienski, who heads up the AIA’s phalanx of legal staff. Heightened regulatory requirements would force companies to siphon capital away from underwriting and could see products either withdrawn or prices ratcheted up. “It’s damned if you do, and damned if you don’t, for consumers.” So there is much at stake. In the midst of this designation process, however, a serious foreign threat lurks on the horizon, Zielezienski contends. In the Swiss city of Basel, the International Association of Insurance Supervisors, a committee of worldwide regulators situated in the Bank for International Settlements, has been tasked by the Financial Stability Board with recommending whether and how insurers should be deemed “globally” systemically important. <i>Global Financial Strategy</i> understands that the IAIS will publish its proposals – covering the indicators and methodology to determine G-Sifi insurer designation, and specific policy recommendations, possibly involving a surcharge – in February next year. Meanwhile a progress report will go to the G20 in Cannes this November. The IAIS is then expected to wrap up the process by mid-2012. According to Zielezienski, a former commercial litigation lawyer, there is a distinct risk that this parallel international G-Sifi process, which for the past 18 months or so has been lagging behind the US, could now wreak havoc with his country’s own Sifi designation process. He fears that with US timings still unclear, rather than take their lead from Dodd Frank, regulators on the new Financial Stability Oversight Council, which is given power under Dodd Frank to designate an insurer as a Sifi, will have no choice but to consider the IAIS’s own criteria. The result could be that more insurers are categorised Sifi than would otherwise have been the case. “Right now we are in the middle of the regulatory process which is fleshing out all this criteria. The concern is that by playing catch-up [the IAIS] will actually get ahead of the US process, and that will influence the US. Zielezienski is dismissive of suggestions that being labelled too big to fail might actually be a boon for an insurer – that it will show that it is entitled to free government support, and ensure that confidence flows through to the marketplace and investors. But while US regulators may find themselves under immediate international pressure to write binding regulations against so-called systemic insurers, there is no certainty that other countries will follow suit, the general counsel argues. The IAIS is merely a “trade association”, he says, and has no power to enforce its own standards – even with FSB and G20 backing. This could put US insurers at a real competitive disadvantage to those abroad, he suggests, if the FSOC finds it is has gone further than others are prepared to follow. “It can produce standards, but it can’t force the national regulators that are a member of the IAIS to adopt them because it really is up to the legislators in those countries to pass those standards – they will pass those they want to pass. In addition, the AIA is irked that, like other national insurance associations, it has been cut out of the deliberations underway at the IAIS. Industry groups such as the AIA are normally able to sit in on IAIS meetings. They attended a February meeting in Basel that discussed the G-Sifi process and met again in May in Kansas City to talk about data collection and confidentiality. Then the public process abruptly stopped. Under the current plans, the industry will have to wait until the formal public consultation in February to express its view. But by this time the designation indicators, methodology and policy proposals will have already been formulated, at least provisionally. Sources suggest that the closed meetings now under way on the IAIS’ Financial Stability Committee are driven by a need to meet tight deadlines imposed by the FSB, rather than any desire to shut the industry out, and that even if insurance associations are not involved anymore, dialogue with individual firms has not ceased. This is of little comfort to the AIA. “I’m concerned,” says Zielezienski, “that what started out as an open and public process has been reversed. It’s now a matter of ‘trust us, we’re going to develop criteria that are fair and appropriate’ without a real way of evaluating indeed whether or not they are fair and appropriate. The AIA also believes that – as well as potentially moving too fast and being “secretive” – by proceeding with a request for highly sensitive data from specific companies without first developing broad designation criteria, the IAIS has the whole process the wrong way around. “There is no need to do it the way they are doing it,” says an exasperated Zielezienski. “Who they are targeting we are not sure, but the concern is that this is proceeding backwards. The first thing that ought to be done and subject to public debate is the development of the criteria, not data calls that result in the development of criteria. The data request, which <i>Global Financial Strategy</i> understands has gone to less than a hundred firms, asks for information on a company’s exposure to derivatives, its business in credit default swaps and repurchase agreements. It also looks at, among other things, degree of subsitutability and market segmentation, as well as degree of interconnectedness and cross-ownership of equity debt – data sets not too different from that requested by the Basel Committee on Banking Supervision from banks. However it is unclear which of these will be included as G-Sifi insurer criteria. While the Basel committee has said it expects some 28 banks are globally systemic, no such figure is believed to exist for insurers. Although the AIA has complaints about the FSOC process, Zielezienski says that at least the FSOC had 10 broad Sifi criteria, such as nature, scope, size, scale, concentration and interconnectedness, already outlined in section 113 of Dodd Frank. The AIA finds the apparent insistence by the IAIS to emulate the Basel committee’s procedures of pursuing data before criteria – even if under the direction of the Financial Stability Board – deeply troubling. “It is a concern that somebody felt the need to proceed in the same manner as if insurers are the same as banks in the G-Sifi process. That troubles me. That reflects a misunderstanding about the way insurers work,” Zielezienski says. Although the data collection was set to begin in June, it is understood that it was set back weeks due to continuing concerns over confidentiality and data security among affected businesses. This is one of the insurers’ worst fears, says the general counsel, that sensitive data imparted to the IAIS might inadvertently find its way into the public domain. The exercise poses a huge commercial and legal headache for the firms involved, he says. “The reputational risk for some of these companies is high. There is also a question mark over whether all the data being requested, if it is not publicly available, can legally be channelled through to the IAIS, he adds. “Does state law, for a US company, provide enough comfort for them to hand data to another state’s commissioner who in turn, by agreement, hands it over to the IAIS or [the Bank for International Settlements and Financial Stability Board] – the ultimate recipient? The insurance industry has had its fair share of problems with the US Sifi designation of course. Firms have complained that draft FSOC regulations published in January gave far too few details on which insurers will be captured under the US definition. He continues: “We are advocating that the process focus on those criteria that truly identify those companies which are at the hub of the financial system and engaged in unregulated financial activities or shadow banking that present a threat to financial instability. “The best you can do is make sure the process, at least with respect to G-Sifis, is focused on those broad criteria. You know, does the company engage in activities which are both central to the well-functioning nature of the financial system?